Kick off the summer with this Memorial Day weekend tradition at Crystal Mountain. 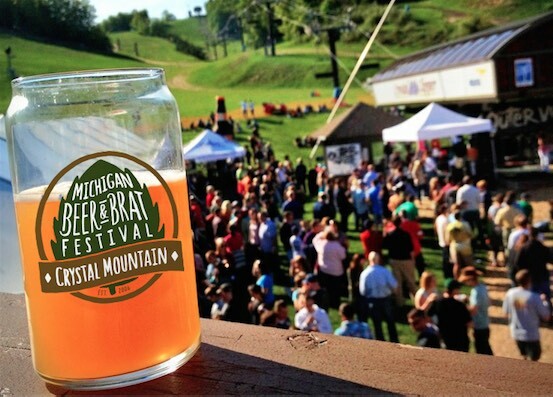 Enjoy live entertainment while sampling an enormous selection of Michigan’s finest microbrews, local hard cider and mead, and gourmet brats from northwest Michigan markets. VIP Admission begins at 3pm, General Admission from 4-8pm. VIP Package includes: Admission at 3pm (one hour before general admission) to the Michigan Beer & Brat Festival, one (1) beer glass (9oz) and 20 tickets. Plus, you’ll have exclusive access to two specialty beers on the Reserve Beer Trail! General Admission Package includes: Admission at 4pm to the Michigan Beer & Brat Festival, one (1) beer glass (9oz) and 10 tickets. Wristbands are available for pick up May 10 – 25, at Crystal Mountain’s Front Desk, located in the Inn at the Mountain. If you are picking up your wristband on Saturday, May 25, wristbands will be available at the Front Desk until Noon, or you can visit the lower level of the Crystal Center after 2pm. Any guests ages 21+ must show valid photo I.D. at admission to the festival. Coolers are not permitted on the festival grounds. Additional tickets will be available to purchase at the festival for $1 each. Tickets can be used toward a wide selection of Michigan craft beers, brats and delicious sides! No refunds. *Some specialty craft beers and meads may be 4-6 tickets due to limited availability.